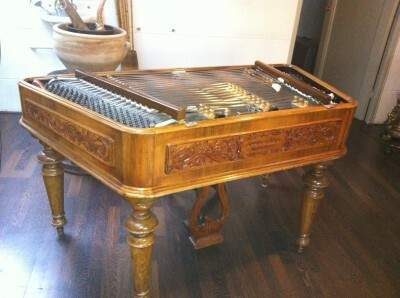 Here is my new cimbalom which I bought in Amsterdam. This was bought from the estate of famous Dutch painter Constant. He was a collector of guitars, lutes and cimbaloms. 4 Responses to Here is my new cimbalom which I bought in Amsterdam. I am so pleased that you have contacted me about Gilbert. Where do I start? he has certainly been one of the most important people in my career as a musician. I was born in Preston Lancs with music in my family (my father was a big band drummer and my aunt a pianist). They did not come from the classical tradition but from dance music and light entertainment. From an early age I wanted to be a professional music and have been all my 60 years. I have been at the top of the music business and remain so, and I put this down to help I received from not only Gilbert but Janet also. I wanted to go to Royal Northern Manchester College of music as soon as I was able but at my first attempt I was appraised by an elderly timpanist from Halle orchestra age 16. Because I was more from entertainment and he from classical music, it did not work out and I had to wait until I was 18. This time, 1973 big developments had taken place with a brand new college being created by the amalgamation of 2 Manchester colleges. A new staff meant that Gilbert Webster had been brought from London. This time I was not going to take any chances, because I knew he was real celebrity in percussion. I found old xylophone music endorsed by Gilbert with his picture on and took to my audition lots of other music to play with an accompanist from Preston. When I met Gilbert he was holding some drum sticks and he gave me a pair. Then he said copy what I do. We played some drum rudiments together then he said, that will do. Thinking I had failed, I said what about all the music I have brought to play for you, to which he replied, Oh you won’t need that just come in September. This was my first meeting with Gilbert, after which we became very close and I was sort of adopted by his family. I visited his flat in Baker St. many times and he used to like recording himself and Adie together, I still have some of his tapes. I could tell you much more about him if you wish and will pass on your email to some of my closest colleagues who had equally formative experiences with him, and owe a similar debt of gratitude. I have a lovely photo of him and Adie on Brighton Pier. Thank you so much.